A child’s early experience of school is vital for developing a positive and confident attitude to learning, to work and to other people. 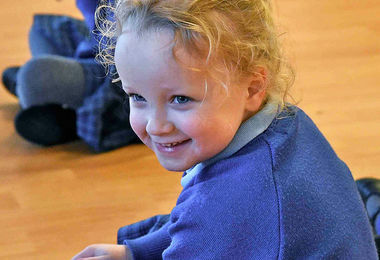 Bishop's Stortford College Pre-Prep gives our 4 to 7 year olds a happy, secure and purposeful start in an exciting, caring environment. As part of a wider community, the Pre-Prep benefits hugely from access to the entire College facilities and specialist teachers for many subjects. There is also huge scope for bringing pupils of different ages together to learn from each other and enjoy each other’s company through shared projects and activities. During their three years in the Pre-Prep, our girls and boys are well-grounded in the basic skills, encouraging them to become independent learners and creative thinkers, right from the start. The beautiful parkland setting surrounding the Pre-Prep is an integral part of being a place which inspires learning, creativity, imagination, exploration and a sense of wonder. Please see the sections below for more detailed information about Pre-Prep life and learning. If you would like to arrange a private visit to Pre-Prep please contact our Admissions Officer, Mrs McGuiness. You may request a copy of our latest Prospectus here. 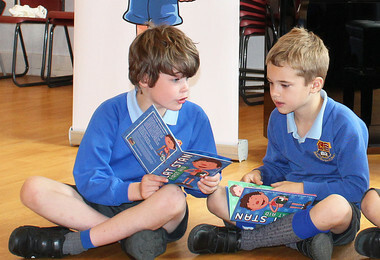 “Throughout the school, pupils are highly articulate. They begin to develop this ability in the EYFS where they question confidently and express their ideas and views intelligently.” ISI Inspection 2017. 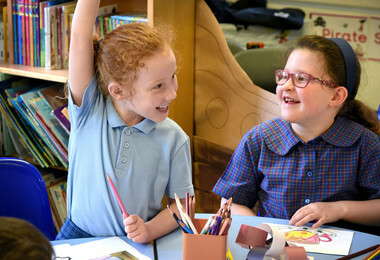 Pre-Pre pupils study English – literacy, language, Mathematics – numeracy and problem solving, Science, ICT, History, Geography, RE, PHSE, Art, Design, Music and PE. The pupils also do Swimming, Dance, Games and Drama. More able pupils are given extension work appropriate to their ability and less able pupils are supported in a small group with individual tasks. Breadth and balance lie at the heart of the education we offer. Our broad curriculum reflects this, with the major areas of sport, music, drama and art being essential ingredients. Our exemption from the restrictions of the National Curriculum has been extended to the Reception Class. This enables us to meet the needs of each pupil often going beyond the National Curriculum and providing numerous opportunities for pupils to be challenged and extend their knowledge. We still support learning under the umbrellas of Personal, Social and Emotional Development, Communication and Language and Physical Development as well as Literacy, Mathematics, Understanding of the World and Expressive Arts and Design. 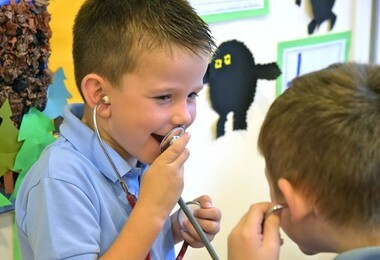 Access to a rich and stimulating curriculum and learning environment takes into account the uniqueness of every child and their interests. 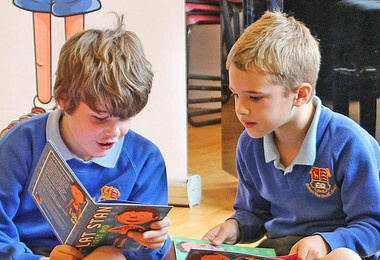 In Pre-Prep we aim to provide a language rich environment which stimulates and challenges each child. We place an emphasis on nurturing the whole child and ensuring that we develop the skills and attitudes that open the door to life long learning. Extending and challenging children to achieve. We are passionate about ensuring each child has the confidence to engage with their peers' learning environment and personal knowledge. We understand that the age of our children is unique in that knowledge and skills are developed rapidly. We celebrate effort and originality, praising perseverance, improvement and a job well done. Helping children to be adventurous is important, whilst guiding them, and we try to enable them to be adaptable, ready to tackle new concepts and to deal with unfamiliar situations with courage to take measured risks. Praise in class and assembly reinforces an ethos for striving to do one’s best and recognition of successes both small and large. Children are proud of their achievements and love to share their successes and work with their parents, teachers and friends. We maintain a close relationship and indeed partnership with parents. Nurturing the imagination, creativity and spirit of enquiry in our pupils is woven into daily Pre-Prep life. It takes place inside and outside in so many ways: art, drama, music, DT, role play and dressing up, individual and collaborative activities, small world play, investigations, construction, trips, visitors and specific sessions developing a knowledge and understanding of the world and personal development (PSHE/PSED), the list goes on! We encourage the children to experiment, ask questions, share their views and think deeply about their answers to open-ended questions. The way we care for and develop our environment is an integral part of our attitude to being a place which inspires learning, creativity, imagination, exploration and a sense of wonder. What we do outside enriches learning in the classroom, whilst what we learn in the classroom is taken outside and applied. Our beautiful parkland setting is a wonderful outdoor ‘classroom’ for work and play, enhancing the children’s experiences in all areas of the curriculum. The grounds have evolved over time with ideas drawn from the children, staff, families and older pupils. A wood sculptor transformed a dying oak tree into a beautiful carving of an owl and squirrels and trees are now flourishing in baby woodland following a family ‘planting’ day. A group of Senior School pupils designed and constructed a pond and conservation area as part of their Duke of Edinburgh Award in a project that sums up the caring, family atmosphere at the College and underlines the strong links between the Pre-Prep, Prep and Senior Schools. There are endless opportunities for exploring, discovering, imagining, creating and, of course, learning. The children feed the birds and fish, plant things in pots Outdoor lessons and experience the sheer magic of our environment from leaves unfurling, observing the changing seasons, looking at wildlife and noticing the impact that humans have on the environment. Making ‘nests’ and ‘buildings’ with the grass cuttings is a popular creative and absorbing co-operative activity involving imagination and planning! Outdoor learning is integral to the holistic approach that our Pre-Prep takes to ensure that every child engages with their learning. Learning outdoors is a fundamental role in children’s education. Forest School offers unique opportunities to discover, explore and create in a natural and safe environment. It aims to offer all learners regular opportunities to achieve and develop confidence and self-esteem through hands-on learning experiences. Forest School builds upon the learning processes which children make and focusses on the ‘how have you achieved this’ more than the ‘what have you achieved’. 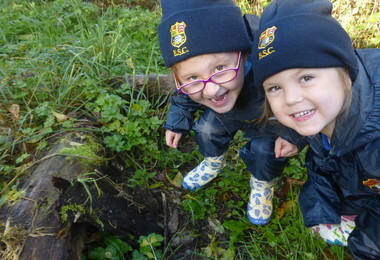 These outdoor learning opportunities take place in our Pre-Prep Woodland based on site. Weekly Forest School sessions will provide equal opportunities for all children to have the freedom to explore the ever changing environment and to learn valuable life skills. Children will be safe and secure in the environment and be able to take risks with growing confidence and learn how to make sensible decisions and assess the risks for themselves. Children will be given opportunities to investigate tools, play, learn boundaries of behaviour, and become motivated whilst developing an understanding of the natural world. Children engage in achievable tasks and activities throughout the year and in almost all weathers. Forest School is led by the child’s interests and builds upon their previous learning and experiences. Sessions are planned by qualified Level Three Forest School Leaders in six week sequences with a progressing theme. The sessions are delivered by qualified Forest School practitioners. 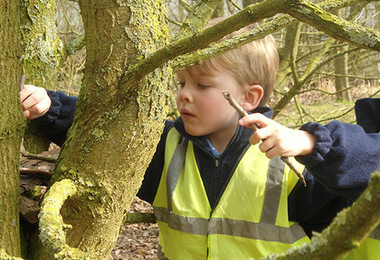 Each Forest School journey is specific to the individual child and achievements made are unique.